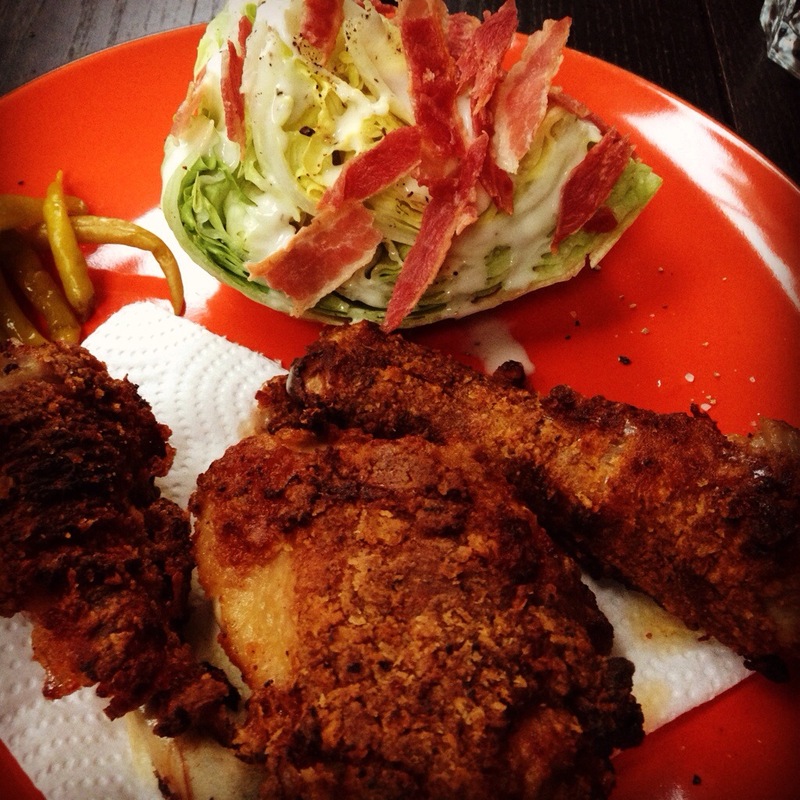 stevemyalleats | Food. Growing, cooking and eating it. Most British food lovers of a certain age will recall the tag line “don’t say vinegar say Sarsons” and I am among them. Dripped over fish and chips still in their paper there is surely no better use for the brown malt liquor. And as any allotment holder will tell you it is a vital preservative in making chutney and pickling onions, beetroot and other root vegetables. 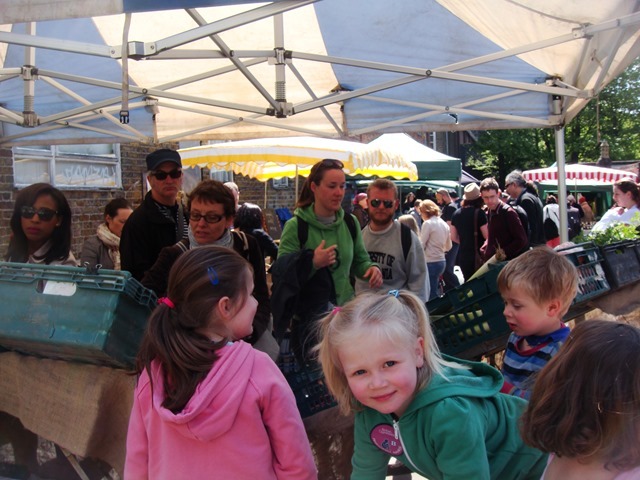 Generations have used it to store fresh produce over the winter months – including eggs (many will have seen the giant jar of other worldly looking hard boiled eggs swimming in vinegar perched on a fish and chip shop counter). But as with everything food it often falls to fashion to dictate the contents of our larder and after a few years as a preserve (pun intended) of the older generation pickles have become cool again. In attempt to latch on to the trend Sarsons invited a group of journalists and bloggers to Rita’s for a brief lesson in pickling. With a pickled ginger cocktail in hand it was soon clear how easy it is to get yourself if not into then in possession of a pickle. The expert in charge was archaeological expert and food enthusiast Peter Ginn, last seen on the BBC series Victorian Farm, and he explained the word vinegar comes from the French vinaigre meaning soured wine and that is exactly what it is. Originally a way of storing a glut of fresh produce over winter in the same way salting, smoking, potting, canning and drying does it was the refrigerator which saw it fall out of fashion. It’s coming back now though and places like Rita’s do their own sauerkraut and kimchi and it’s a nice way to express a love of home cooking craft. 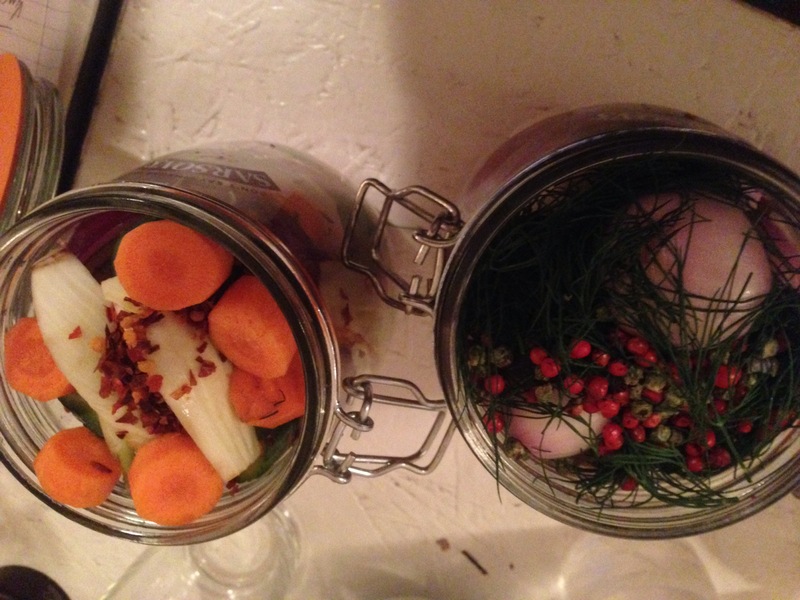 Pickling is actually shocking simple, you need your vinegar, which must have a minimum of 5% acidity, your vegetables or fruit and a sterilised container like a kilner jar or old jam jar and lid. You can sterilise by boiling in water or in a hot oven. Then it’s easy, grab some of favourite herbs and spices add to the jar. In our lesson there was red, black and white peppercorns, a variety of dried chillies, coriander, cumin and fennel seeds, dill, rosemary, tarragon and sage. Next you fill with what you want to pickle (you’ll need to blanch onions or shallots and hard boil eggs) before pouring over enough vinegar to cover them trying not to let any poke above the liquid line. 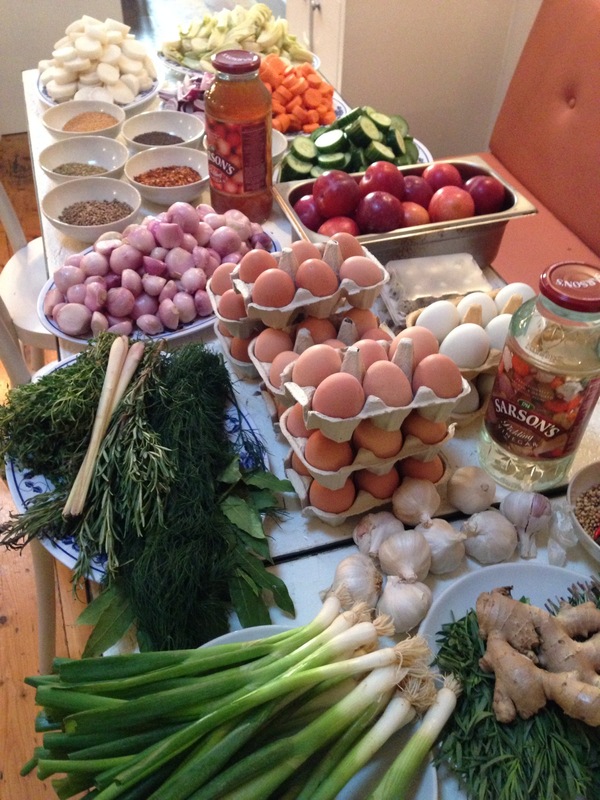 You can try carrots, onions, eggs, mooli (japanese radish), cucumber, lemons, plums or anything your imagination allows. 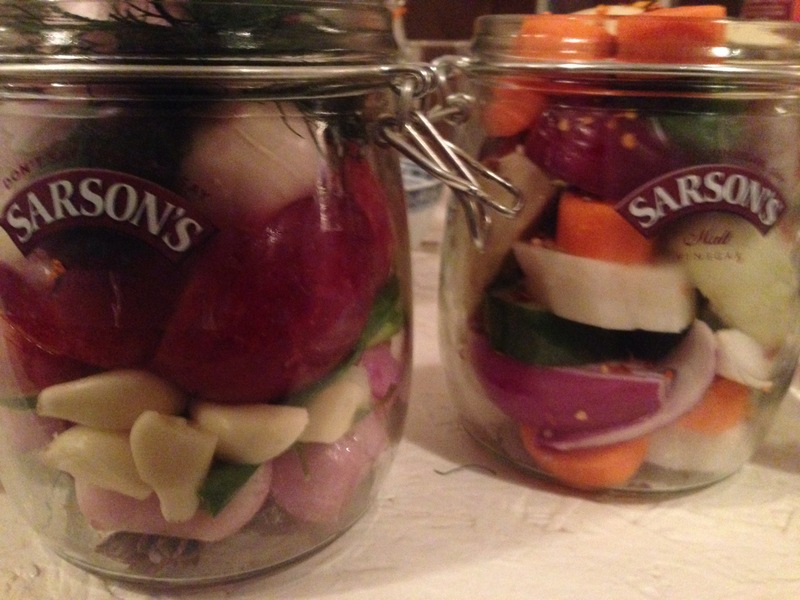 Seal your jar and leave for three or four weeks and enjoy on their own or with cold meat and cheeses. I’m very excited to see how mine turn out and am interested to try a more exotic pickle. One Peter said he wants to try is so-called English bamboo – alder! Apparently there is a recipe in the 200 year old cookbook A New System of Domestic Cookery – one for a dedicated pickle fan. I recently visited (Coppa a rooftop bar near London Fields in East London, where I had a rather disappointing roasted pepper bruschetta among other much more delicious dishes. 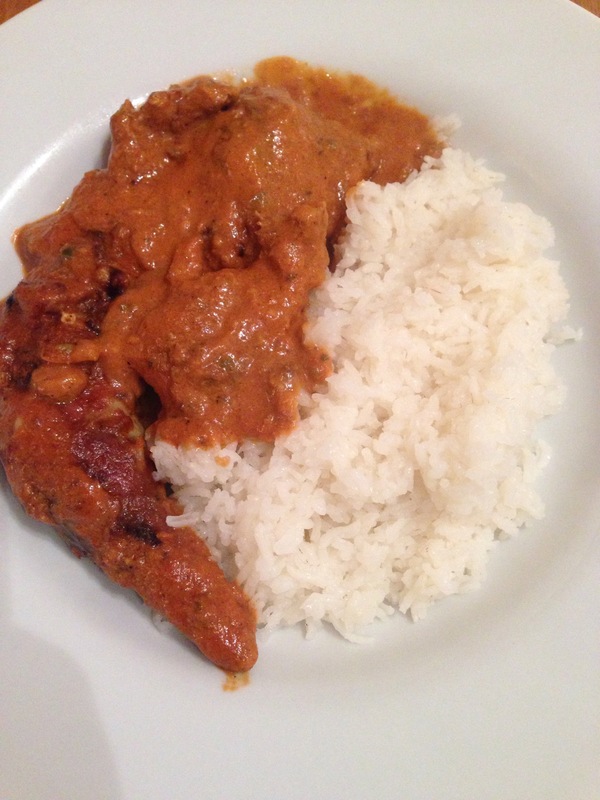 It got me thinking about how to improve on the flavourless peppers and I found a Nigel Slater recipe which I’ve tinkered with and I have to say was delicious. 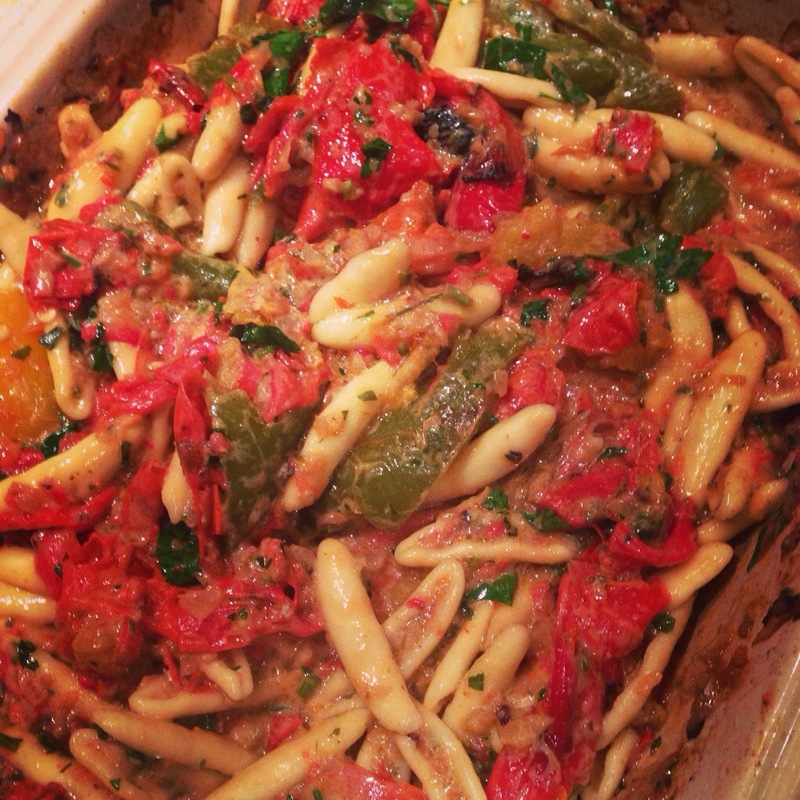 The quantities are pretty vague so please have a play around, I tossed some freshly cooked pasta through my finished dish but it would work equally well on toasted ciabatta or as a side dish for BBQ chicken. Small bunch of parsley, leaves picked and stalks finely chopped and reserved. 4)Meanwhile in a food mixer chop onion, garlic and chilli. 5)Add to peppers and toss to coat with juices in dish and return to oven for 25minutes. 7)Remove from oven, stir in creme fraiche and remaining cheese, check seasoning and serve. It is here that you can stir in your cooked pasta with a couple of table spoons of cooking water to keep the mixture loose. I am in the process of sorting out my allotment for this year and had some rather leggy cavolo nero. Usually I serve it on the side of a roast with a light anchovy butter sauce stirred through it. I decided to dig it out and put some new seed in but it left me with a bag of the winter cabbage so I decided to try something different. In this recipe it replaces the basil usually used in pesto to make a rich dark green glossy sauce. 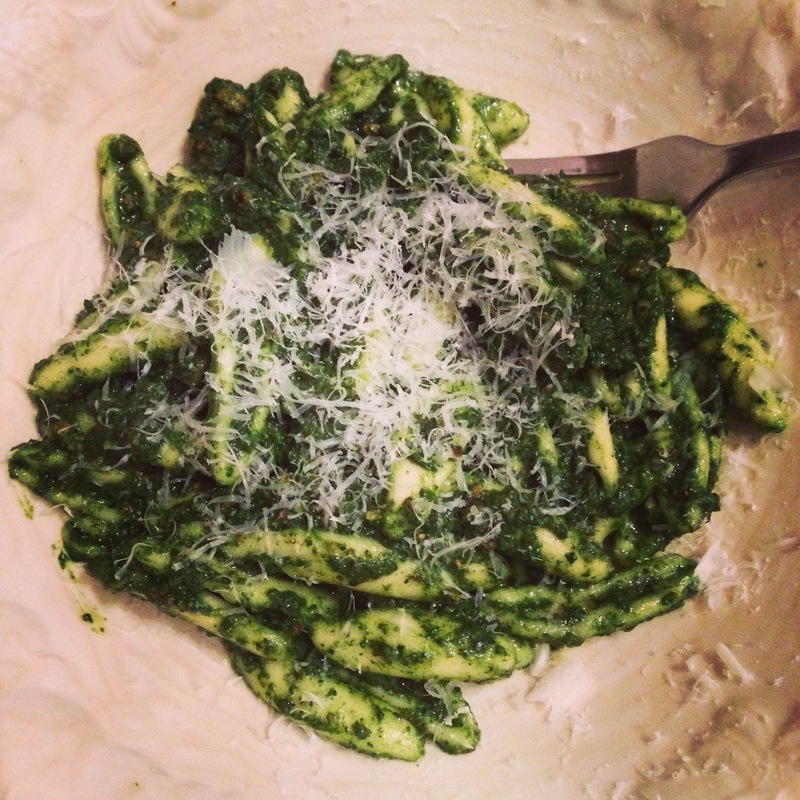 It’s delicious and a lovely alternative to pesto. I’m looking forward to a new crop. 4) Add cheese, oil and water and blend again until glossy, add more oil if you need. 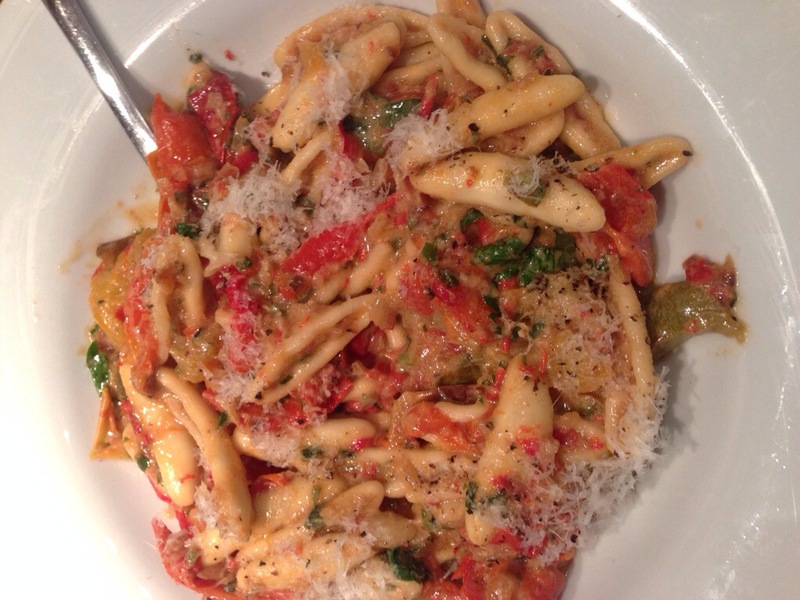 5) Stir sauce through pasta and finish with a grating of cheese. Nathan Outlaw is the God of cooking fish. 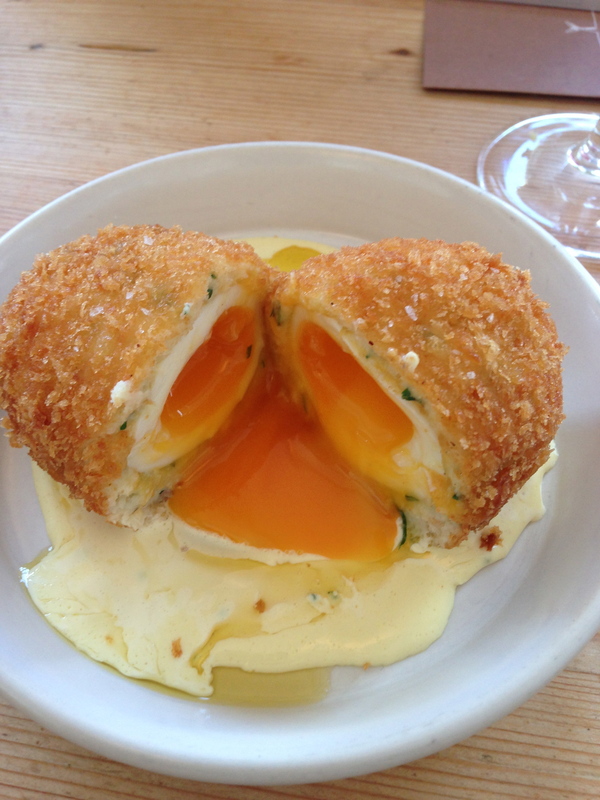 Just look at this Smoked Haddock Scotch Egg with Curry Sauce. Delicious. Taking all the the ingredients of the breakfast favourite Kedgeree an turning it into something infinitely more moreish – we had two of these at £8.50 a pop. Nathan’s cooking isn’t budget but as, in my view, he is the perfect person to serve you fish on a Cornish holiday I don’t mind paying because that is about my favourite way in the whole world to spend my time. This is the latest restaurant in his mini empire and offers a fish based tapas style in a converted fisherman’s cottage in Port Isaac – where the TV series Doc Martin is filmed. The new venture is overseen by chef Paul Ripley, like Nathan an alumni of Rick Stein’s famous Seafood Restaurant in Padstow, and whose food I once ate at the now defunct Ripley’s restaurant in the same area. Nathan meanwhile is based St Endoc Hotel (www.enodoc-hotel.co.uk) in Rock, Cornwall, where he has his renowned Restaurant Nathan Outlaw which was awarded 2 Michelin Stars in 2011 and has been named as the Best Seafood Restaurant in the UK by The Good Food Guide, and his more relaxed Outlaw’s Restaurant. I’ve eaten at both and the tasting menu at the former is one of the best meals I have had. 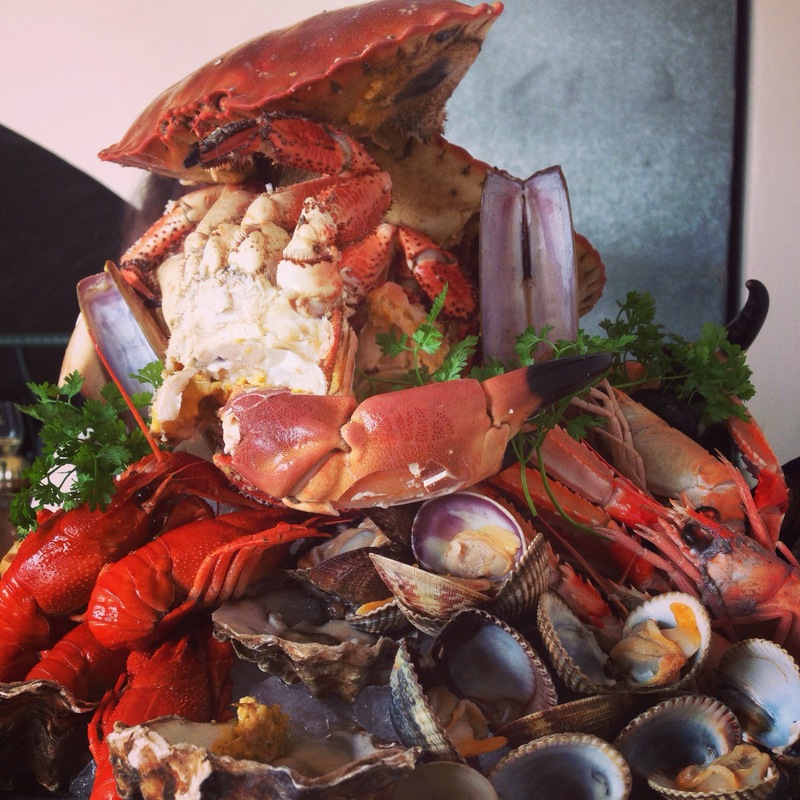 I’ve yet to try his London venture – Outlaw’s at The Capital Hotel, London – and I’m worried eating fish miles from the ozone of the sea won’t be the same but it’s on my list. Back to the Fish Kitchen. I visited in February with two friends and their little girl and we were able to get a table straight away. However it is worth noting that the restaurant is small and does not take bookings at lunchtime and the waitress told us that there were huge queues when it opened last summer. We were recommended to take three dishes each but we started off with two and then added to them as our hunger was sated and our tastebuds called for repeat courses and more variety. 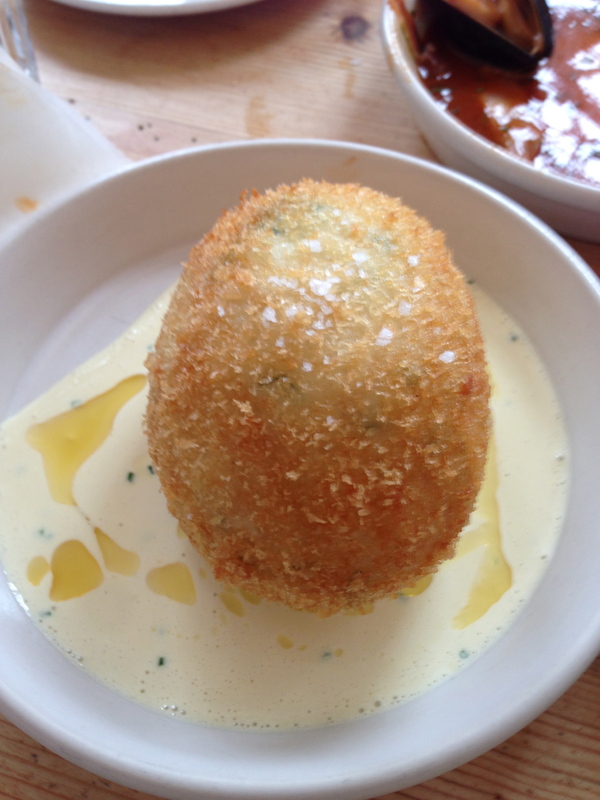 The highlight for us all was the Scotch Egg. It’s worth going just for this and I expect it to become a classic, warm, crispy, soft, runny, smokey, creamy and mildly spiced. The windows of the restaurant look out onto the harbour where some of the fish served in the restaurant is landed and the menu alters depending on what fish is best and available. 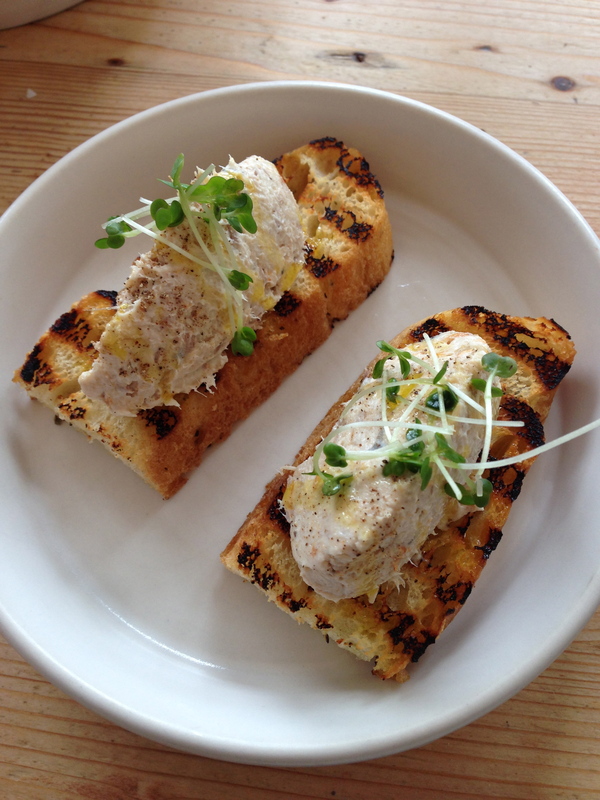 Then came a special of smoked mackerel pate – I expect this was extra item added because of a problem with fish supply caused by terrible weather. I have strong childhood memories of pulling a string of mackerel from the cool water of the coast and so think of the fish as the emblem of the county of Cornwall and the pate did the fish the justice it deserved. 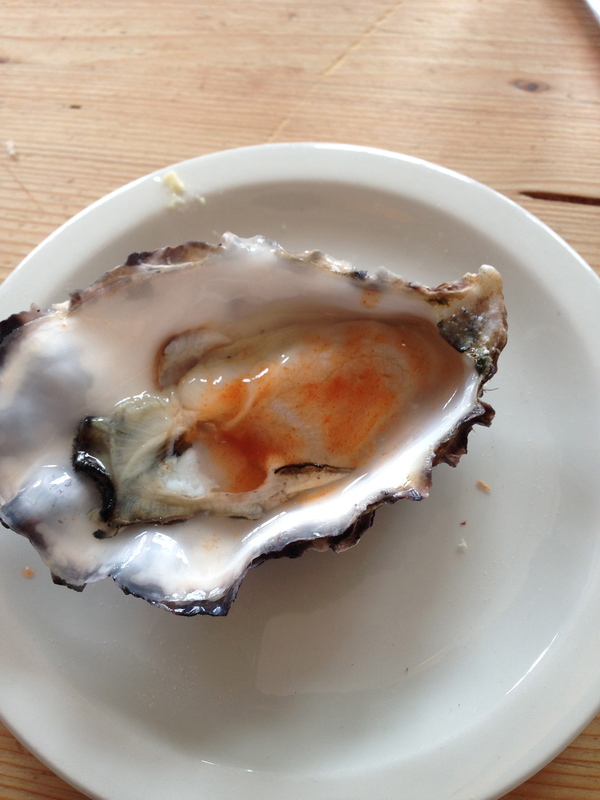 We each had a plump Raw Porthilly Oyster at £3 which brought the ultimate taste of the sea. 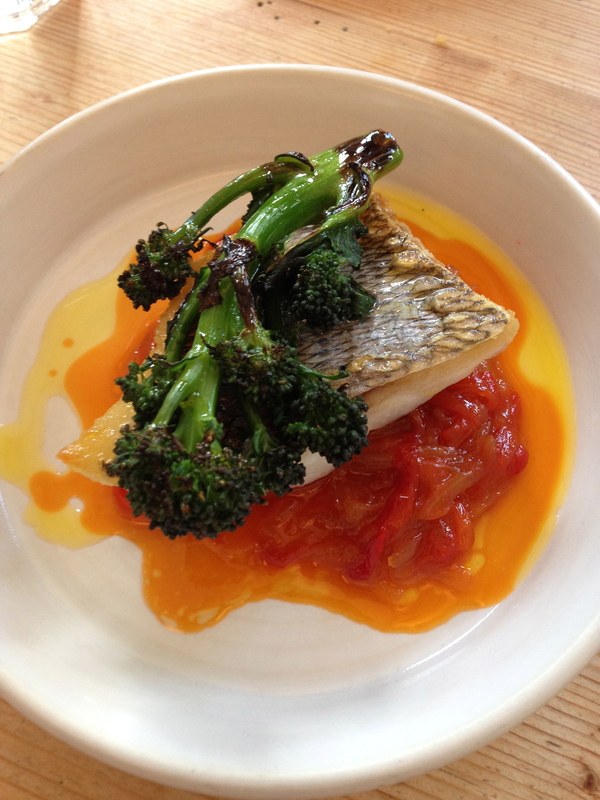 Next was the Wild Black Bream, Roasted Red Pepper and Thyme Marmalade, £10, which brought a nice contrast of robust flaky fish flesh and sticky sweetness. 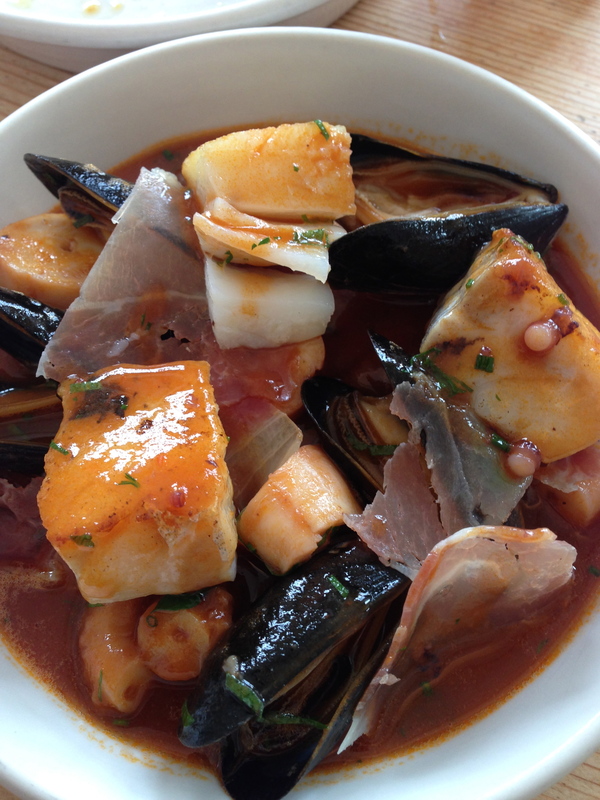 Next came a Seafood Stew: Salt Cod, Octopus, Mussels and Lomo Ham, £13, which was a perfect salty mouthful of tomato loveliness. 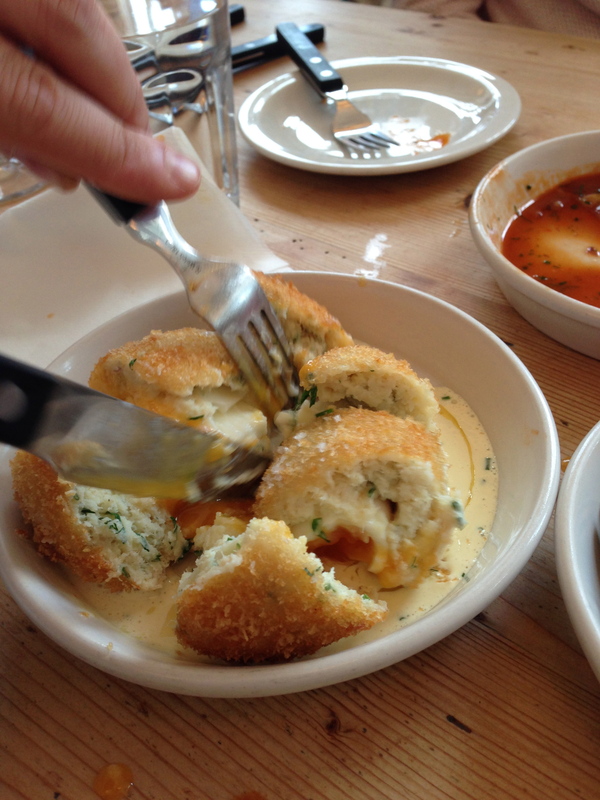 I’d like to see this on another menu as a main course, perhaps with a some fresh bread and butter. 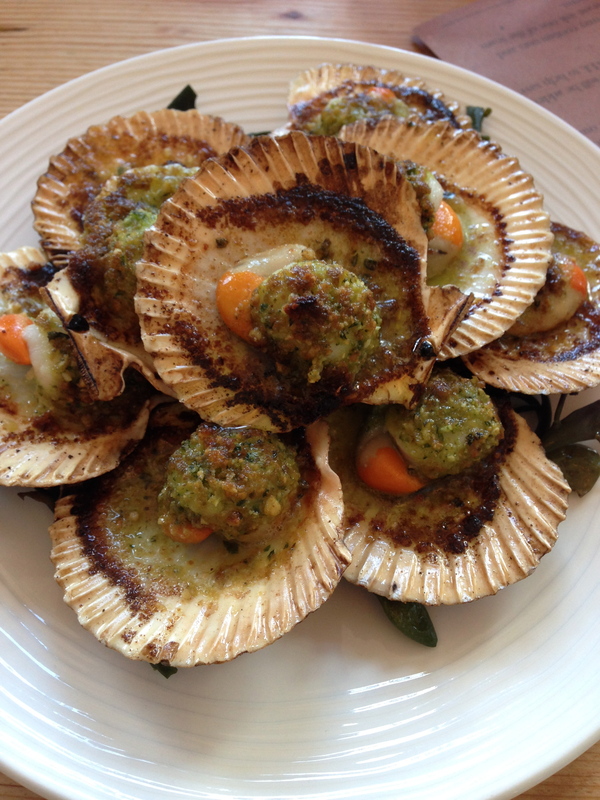 Another special on the menu was a plate of tiny bay scallops served on the half shell which had been grilled with a buttery and herby sauce. I guess there were about 10 of these for the £15 and they reminded me, if only in sight not flavour of a plate of escargots. 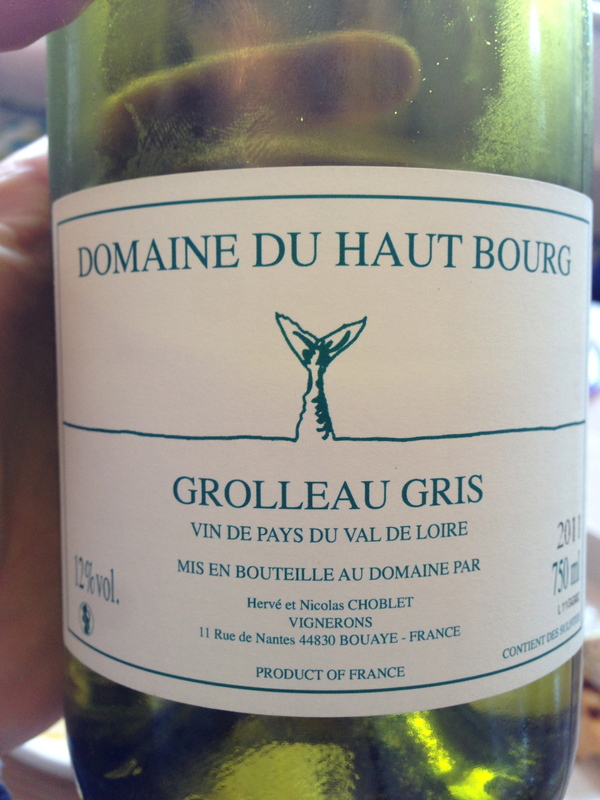 At this stage of the meal we were on our second bottle of Outlaw’s Grolleau Gris, 2011, and my photography took a backseat to the business of eating and drinking. I know we ate Crispy Ling, Pickled Carrot and Green Chilli, Roast Garlic Mayonnaise, £8, and a plate of dainty Shoestring Potatoes, £3, which were both delicious – the Ling being a fish with a consistency similar to Monkfish. 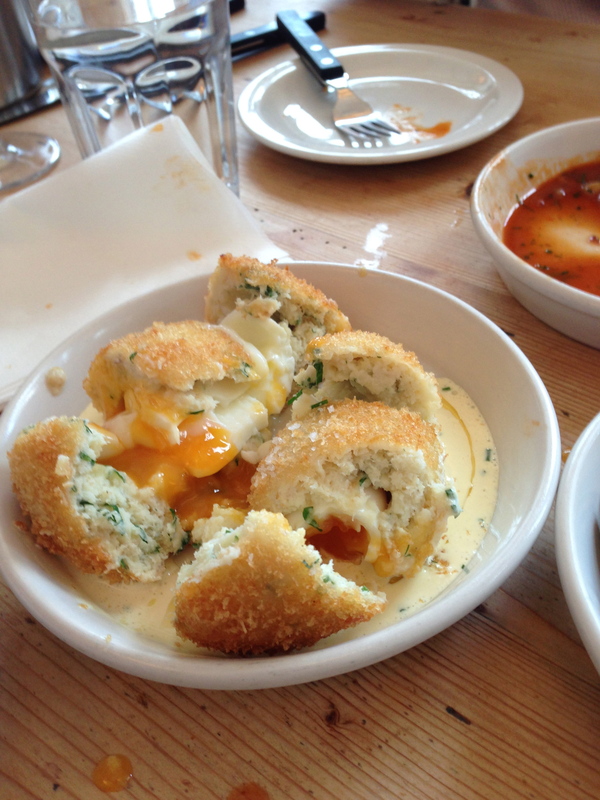 There was another Scotch Egg, and in hindsight I am surprised there weren’t more. 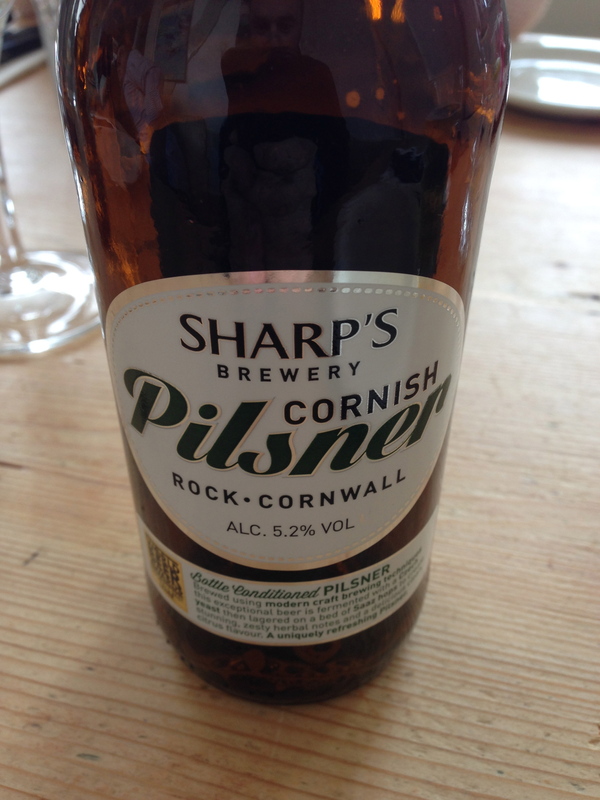 As well as the wine we also drank a bottle of Sharp’s Cornish Pilsner, £5, which was perfect with the scallops and was voted World’s Best Lager at World Beer Awards 2013, Gold, which as far as selling points go is about as good as it gets. To finish the meal we shared Baked Rice Pudding, Gingerbread, Rhubarb and Ginger Sorbet, £7, and a Dark Chocolate and Salted Peanut Brownie, Vanilla Cream, Butterscotch Sauce, £7. The puddings were washed down with a glass of Muscat de Rivesaltes, £6.50, and all too soon the meal was over. If you like fish this is wonderful restaurant with a relaxed ambience and some great cooking. Another hit for Nathan and his team. I’ve fallen for Outlaw’s Fish Kitchen hook, line and sinker. 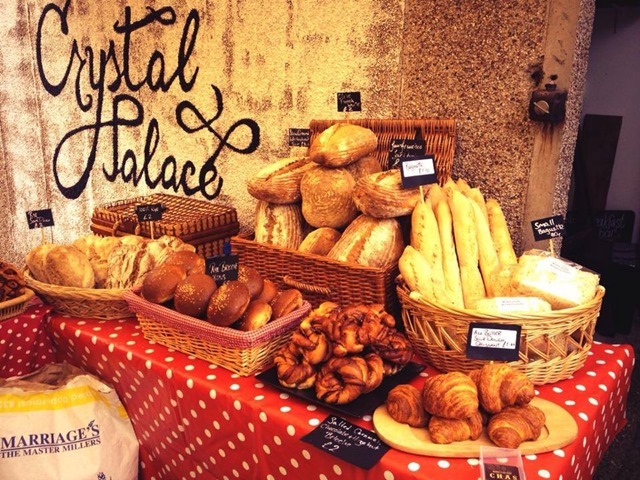 My holiday to Cape Verde and culinary experiences there.